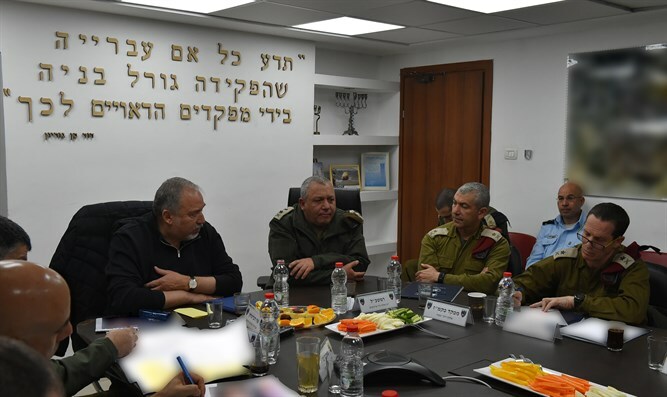 Defense Minister Avigdor Liberman toured the Jewish community in Hevron on Tuesday morning, together with Chief of Staff Lt. Gen. Gadi Eizenkot and the head of Central Command, Major General Roni Numa. COGAT head Major General Yoav Mordechai and senior police and Shin Bet officials also participated in the visit. The Minister of Defense conducted an assessment of the security situation and toured the various defensive points surrounding the Jewish community in Hevron and around the Tomb of the Patriarchs. “In Central Command, and especially in the city of Hevron, extensive counterterrorism activities have been carried out in recent months, with between 20 and 30 attacks thwarted a week, in light of the increasing efforts of terror elements,” Liberman said. The Defense Minister took advantage of the visit to thank the Commander of the Central Command, Major General Ronny Numa, who will step down from his post next week, and grant good wishes to his successor, Maj. Gen. Nadav Padan: “Roni, resolutely, methodically and with great sophistication and creativity – Central Command under your leadership succeeded in crushing, almost completely, the wave of terror and knifings, and maintaining stability in a difficult reality. ‘We must not delude ourselves. The war on terror has ups and downs, successes and mistakes. What you did and what you will do for the security of the State of Israel, we all owe you thanks and appreciation,” Lieberman stressed.